Happiness Is a Choice You Make: Lessons from a Year Among the Oldest Old (Hardcover) | Water Street Bookstore, Inc.
An extraordinary look at what it means to grow old and a heartening guide to well-being, Happiness Is a Choice You Make weaves together the stories and wisdom of six New Yorkers who number among the “oldest old”— those eighty-five and up. In 2015, when the award-winning journalist John Leland set out on behalf of The New York Times to meet members of America’s fastest-growing age group, he anticipated learning of challenges, of loneliness, and of the deterioration of body, mind, and quality of life. But the elders he met took him in an entirely different direction. Despite disparate backgrounds and circumstances, they each lived with a surprising lightness and contentment. The reality Leland encountered upended contemporary notions of aging, revealing the late stages of life as unexpectedly rich and the elderly as incomparably wise. Happiness Is a Choice You Make is an enduring collection of lessons that emphasizes, above all, the extraordinary influence we wield over the quality of our lives. With humility, heart, and wit, Leland has crafted a sophisticated and necessary reflection on how to “live better”—informed by those who have mastered the art. 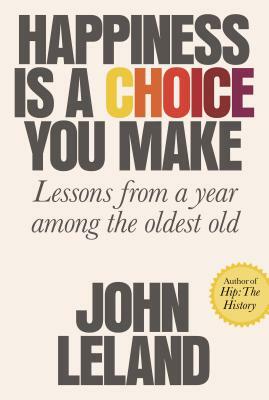 John Leland is a reporter at The New York Times, where he wrote a yearlong series that became the basis for Happiness Is a Choice You Make, and the author of two previous books, Hip: The History and Why Kerouac Matters: The Lessons of “On the Road” (They’re Not What You Think). Before joining the Times, he was a senior editor at Newsweek, editor in chief of Details, a reporter at Newsday, and a writer and editor at Spin magazine. A People magazine "Best New Book"